Spend an hour talking with the organizers and participants of ARTS Space Obispo’s Tomato Show, and you may begin to view food in an entirely new—not to mention sensuous—light. Words like mellow, luscious, rich, subtle, smoky, and mild replace terms traditionally employed to describe art. Winkler became involved with the show after Melinda Forbes, a member of ARTS Obispo’s board of directors and gallery committee, suggested that her imagery would fit well within an agriculturally themed show. In 2001 Winkler’s work was featured in an exhibit titled Food Arts at Big Sky Caf». 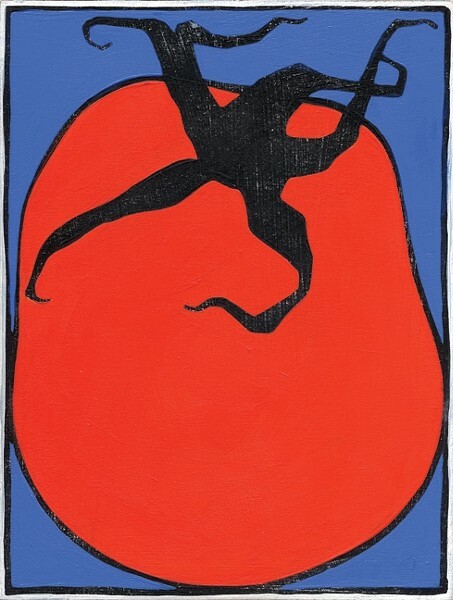 Despite the fact that Winkler has painted a variety of produce, including onions, apples, pears, and figs, the exhibit’s defining image was of a tomato that had been cut open. The Templeton resident suspects that between her tomato image at Big Sky and The Tomato Show at The Creamery, she may become known as the patron artist of tomatoes. Not that she really minds. Prior to moving to Templeton and becoming a stay-at-home mom, Winkler spent 12 years working in the food industry, and is a self-described food lover who sees beauty in vegetables. And she knows she’s not alone. Despite the fact that the show was last minute by art gallery standards, Winkler decided that she would produce 30 small-scale, six-by-eight-inch paintings and drawings for the exhibit. 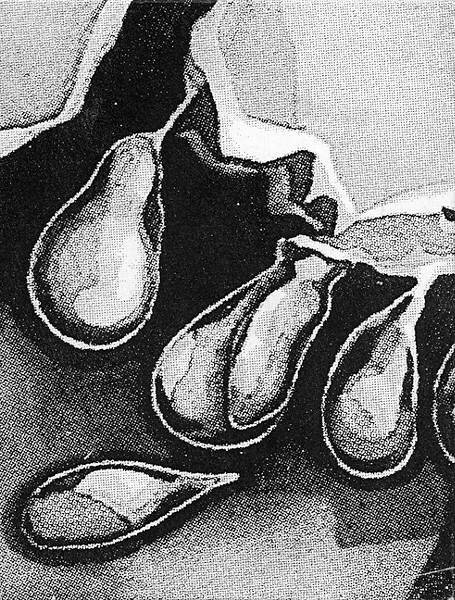 The 30 paintings were divided into several small series, focusing on the color, composition, or texture of the fruit. A quintet of vibrant Warhol-esque tomatoes is preceded by a shockingly vivid watercolor of a tomato’s interior. Just as Winkler’s exploration of the tomato has taken her miniature images in divergent directions, her use of materials is equally creative. Watercolors, colored pencils, acrylic paint, ebony pencil with turpentine, and oils all contribute to Winkler’s ever-growing tomato arsenal. But the piÀce de r»sistance is Winkler’s seven-by-nine-foot acrylic painting of a tomato large enough to fill at least 1,000 BLT sandwiches. While Winkler doesn’t necessarily object to her title as the tomato lady of the local arts community, she frequently strays from the world of produce. In fact, most of the time she considers herself a figurative painter exploring issues of identity. That doesn’t mean that she isn’t enjoying her opportunity to deviate from her standard path. Having a given subject—the tomato—enables her to explore more freely, she insists. Also, prior to this exhibit she hadn’t shown her work for several years and wasn’t in the habit of painting on a daily basis; now that she’s working every day she can’t imagine how she lived without it. And if Winkler’s tomatoes happen to produce a mouth-watering effect, tomato lovers have the opportunity to participate in a community-canning event on August 3 with Nicole Allegretta of Mama’s Meatballs. It was actually Allegretta’s suggestion that the businesses in The Creamery could support a canning event that prompted the creative minds at ARTS Obispo to host an agricultural exhibit, which Executive Director Marta Peluso informally referred to as The Tomato Show in her notes. Anyone who wants to participate in the event can bring tomatoes and canning jars to The Creamery parking lot. Still later in the month, on August 19, Forbes is serving a fundraiser luncheon featuring organic and locally made food. In addition to offering produce from her own expansive garden, she invited local farms to donate their own harvest as well. With assistance from the Cal Poly Organic Farm, she’s pleased with the amount of support the luncheon has generated. “Gardeners and farmers are very generous people,” said Forbes. Besides preparing a salad from whatever produce happens to be available, participants will dine on baguettes and chevre, and will receive a cookbook with artwork from the exhibit and recipes from the luncheon. The cost to feast on this local bounty is $35. In past years Forbes, who along with collaborator Julie Frankel organized The Peace Library, also participated in ARTS Space Obispo’s Wardrobe Revamp. She approaches the exhibit as a personal and political endeavor, an attitude that seems to characterize all of her undertakings. Living in a community called Garden Farms in Atascadero, it’s not surprising that Forbes has taken an active role in promoting the intersection of art and locally grown food. “I think that a basic human need is food and it is an art to grow food. At this time, people do have a renewed interest in eating healthy foods, and just examine the quality of vine-ripened tomatoes and the difference from that and tomatoes grown a million miles away and sprayed with who knows what. And what is more beautiful? I mean, look at this little bowl of plums,” she said, gesturing to a bowl of homegrown plums blushing violet and red. And on a soft summer day, in a garden that yields scents from all manner of flowers, herbs, fruits, and vegetables, and colors equally profound, it’s difficult to discriminate between the hand that digs eagerly into the dirt and that which yields a paintbrush or molds clay. Art, it seems, is as easily discovered in a humble garden as in the most prestigious museum or gallery. And it tastes significantly better, too. 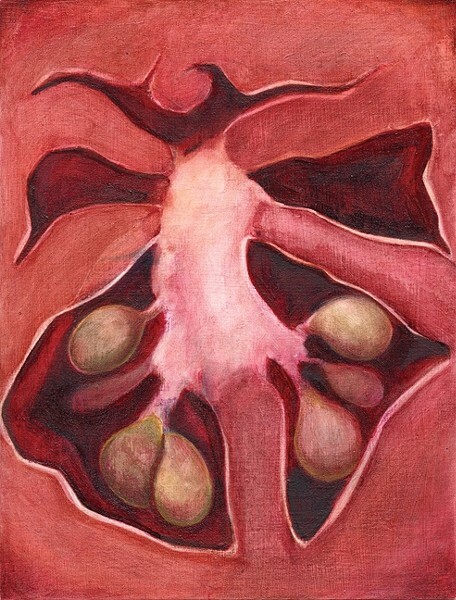 The Tomato Show, featuring paintings by Katie Winkler, runs Aug. 1 to 28 at ARTS Space Obispo with an artist reception Aug. 1 from 6 to 9 p.m. Nicole Allegretta of Mama’s Meatballs will be in the gallery during the artist reception and on Aug. 3 from 10 a.m. to 4 p.m. he will lead a community canning event in the SLO Creamery parking lot. Community members are welcome to bring tomatoes and canning jars to participate in this free event. Canning jars will be available for sale on location. On Aug. 19 Melinda Forbes will serve a luncheon featuring organic produce and locally made olives, oils, vinegars, cheeses, breads and desserts. The cost to participate in the lunch is $35. Call 544-9251 for more information, or to reserve your space at the luncheon. Arts Editor Ashley Schwellenbach stomps tomatoes with abandon. Send thick socks to aschwellenbach@newtimesslo.com.